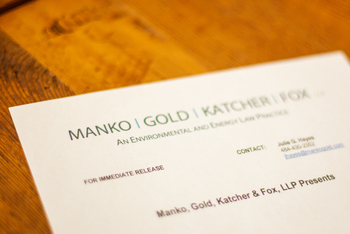 Philadelphia, PA (May 23, 2011) – More than half of the attorneys from Manko, Gold, Katcher & Fox, LLP, the environmental, energy and land use law firm based in Bala Cynwyd, PA and Cherry Hill, NJ, have been included in the 2011 Super Lawyers* list published by Thomson Reuters. Eleven attorneys were listed for environmental law in Pennsylvania Super Lawyers magazine, including Joseph M. Manko, Marc E. Gold, Bruce S. Katcher, Neil S. Witkes, Michael M. Meloy, Robert D. Fox, Jill H. Kaplan, Jonathan E. Rinde, Bart E. Cassidy, Brenda Hustis Gotanda, and Jonathan H. Spergel. Four attorneys, Carol F. McCabe, Nicole R. Moshang, Kathleen Campbell, and Matthew C. Sullivan were listed in Pennsylvania Super Lawyer magazine as "Rising Stars" in environmental law. Thomson Reuters defines "Rising Stars" as up and coming attorneys 40 years old or younger, or who have been practicing 10 years or less. Katcher and McCabe were also included in the New Jersey Super Lawyers magazine - Katcher was listed under "Super Lawyer" and McCabe as a "Rising Star" in environmental law.